The NH-U12P continues the legacy of Noctua's classic NH-U coolers, which won over 150 awards and recommendations from leading international websites and magazines. While retaining the successful design and the well-proven SecuFirm™ mounting system, the newest revision has been reworked for enhanced main board compatibility and now comes with Noctua's NT-H1 pro-grade thermal compound. Fitted with the new NF-P12 premium fan, the NH-U12P brings its predecessors' much-acclaimed quiet cooling performance to a whole new level! 4 dual heat pipes, soldered joints and widely-spaced aluminium cooling fins guarantee optimal heat dissipation even at low fan speeds. 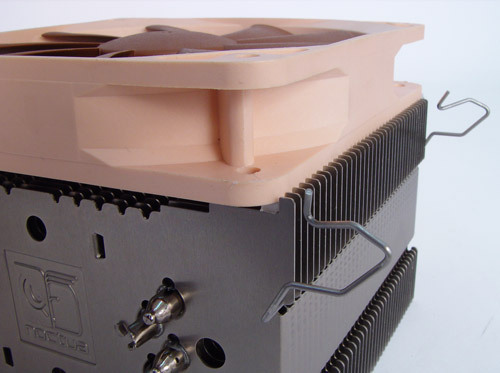 Noctua's NH-U coolers allow for perfect airflow direction and have received more than 150 awards and recommendations from leading international websites and magazines. The NF-P12 has been specifically developed for applications like CPU cooling and brings the performance of the NH-U12 to a whole new level. Thanks to psycho-acoustic optimizations and Noctua's premium-grade SSO-bearing, the NF-P12 achieves exceptional quietness and long-term stability. Thanks to its raised fin-stack, the NH-U12P offers improved compatibility with main boards featuring very high chipset coolers. 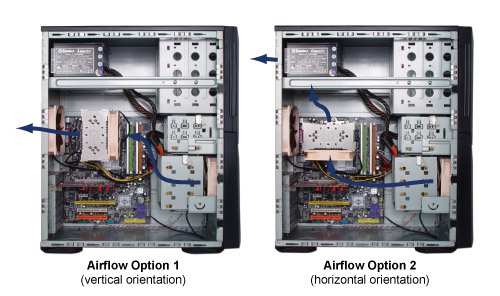 Noctua's professional SecuFirm™ mounting system for LGA 775, AM2, AM2+ and AM3 provides superior reliability and contact pressure. Noctua's NT-H1 is a pro-grade TIM solution that provides minimum thermal resistance, excellent ease-of-use and long-term stability. Alles in allem muss man Noctua zugestehen, eine der am besten abgestimmten und komplettesten Kühlerofferten des Marktes anzubieten. Kühlkörper, Lüfter, Wärmeleitpaste und Zubehör sind keine abgespeckten Bundle-Versionen, sondern das Beste, was Noctua zur Zeit zu bieten hat. Der Kunde erhält also keine Mogelpackung, sondern eine Premium-Combo, deren üppig anmutender Verkaufspreis von über 50 Euro unter diesen Gesichtspunkten als durchaus fair angesehen werden darf. Compared to the other air coolers, the $55 Noctua NH-U12P is a brilliant behemoth. Not only did it produce lower noise levels than the rest, it did so without sacrificing overclocking performance. Most importantly, the Noctua kept our overclocked Phenom's load temperature more than four degrees lower than the best our water cooler could manage. 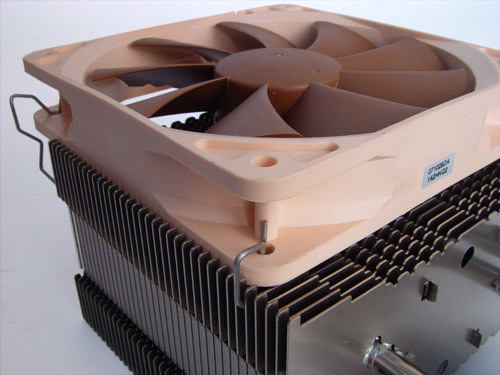 Noctua really has produced a top-performing cooler with incredibly low noise in the NH-U12P. The combination of staggered Vortex Control notches, SC Drive, and SSO bearings in a nine-blade design does the trick as promised. 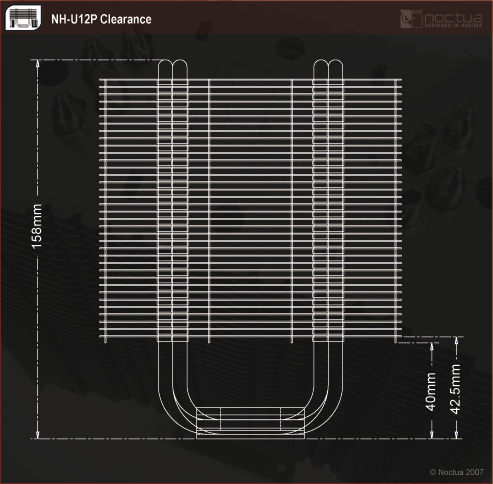 Paired with the venerable and continually refined Noctua heatsink, performance of the stock Noctua NH-U12P mirrors the top Thermalright all the way to 3.91GHz. Noise remains below our system noise floor throughout the entire range of testing. 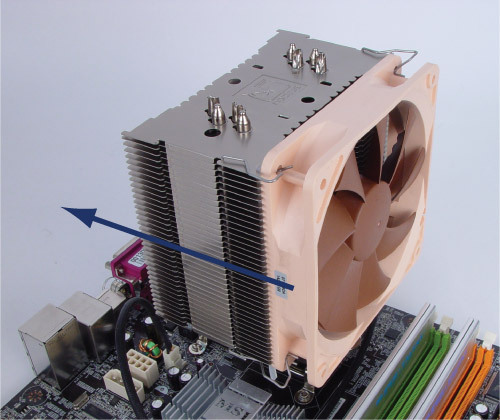 The Thermalright goes on to 3.94GHz with a single fan, indicating the design may be slightly more efficient. However, add a second NF-P12 to the Noctua and it also reaches 3.94GHZ and sets new records for cooling temperatures along the way. Even with two fans, noise remains below the noise floor - and you can reduce it even further with shunts if you choose. We saw no reason to do this as two fans at full speed were still as silent as we could measure in our system - with noise levels below a quiet suburban bedroom at night. Le Noctua NH-U12P est une magnifique révision du NH-U12F. Noctua a corrigé tous les points négatifs de sa première version, avec un ventilateur enfin adapté au refroidissement de radiateurs, une pâte thermique de qualité, une troisième vitesse de rotation disponible, et cerise sur le gâteau un radiateur également amélioré. Here again the Noctua NH-U12P did extremely well, beating the other coolers at idle by 5°C, 4°C factoring in the change in room temperature. At load the three top performers closed in a bit, but the Noctua was still a 1°C ahead (again factoring in the 0.9°C temperature difference). That's pretty darn good results from Noctua. [...] As we have seen previously, the NF-P12 fans are pretty damn amazing and in a heatsink-fan situation this is no different. Not only does the fan produce a very good amount of airflow, it also is incredibly quiet, even when ramped up to it's top speed. On putting on one of the voltage fan extension cables provided, you quite simply could not hear any noise from the cooler. 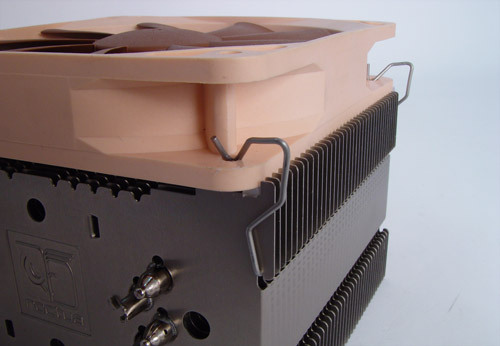 Noctua has worked their magic with a tower-design processor heatsink yet again. It is amazing to see just how far Noctua have pushed it. This newest incarnation beats its predecessor by a few degrees, and offers better compatibility thanks to its better motherboard component clearance. As with many heatsinks, it comes down to the fan used, and thankfully Noctua does not disappoint here. Bundling its kit with the premiere NF-P12 fan shows off what this heat sink can do even while being nearly silent. Mit großem Abstand kann sich der Noctua NH-U12P vor die Konkurrenz setzen und führt souverän das Feld an. When the CPU is overclocked and the voltage is increased, the NH-U12P does even better than the rest of the air coolers. Amazingly, this is all done with a fan that is very quiet. 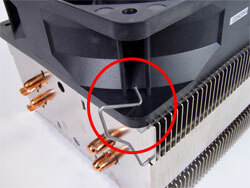 Is the cooler compatible with socket AM2+ and AM3? Which mainboards are compatible with the NH-U12P? Yes. 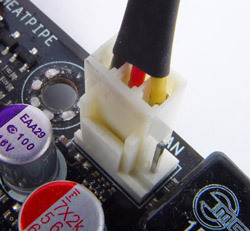 As AM2, AM2+ and AM3 are mechanically identical, the cooler is compatible with all three sockets. 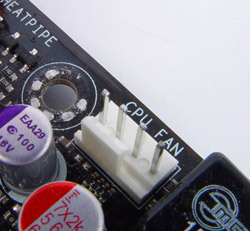 Please consult our mainboard compatibility list for information about compatible mainboards.